Ofer Merimsky today is unique in Israel, highly specialized professional, whose professional activity is focused on the treatment of all types of sarcomas. Thanks to the rich clinical experience and remarkable achievements in the professional field it has earned an impeccable reputation and worldwide recognition. An expert in various areas of oncology actively uses innovative methods of radiotherapy and chemotherapy. Ofer Merimsky practices a holistic approach to treatment, attracting experienced, qualified professionals from various fields of medicine. Today Professor took a leadership position in one of the A leading clinics in the country, and is the head of the community of oncologists of Israel. Jerusalem State University, clinical residency on specialty "General Oncology and radiotherapy". Specialized courses for the treatment of bone tumors and soft tissue, Paris, France. 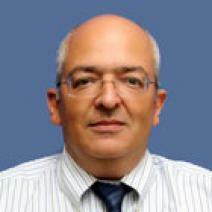 Member of the society of oncologists and radiotherapists Israel. International society for the treatment of tumors of the connective tissue (CTOS). Numerous scientific publications in the field of treatment malignant diseases of the bone and soft tissues as well as lung cancer. I went for treatment in Ichilov hospital-Suraci from prostatitis – I was very much this whole story with pain and incontinence got. I decided now to ask the Israeli luminaries. But it turned out that this is not just prostatitis, under his mask formed a tumor, that is the real cancer! And I years, treated for chronic prostatitis and never was assigned to an in-depth examination. Of course, after diagnosis, the change of plans. I was assigned a full diagnosis to rule out metastases in other organs. They fortunately was not. Then I had a surgery, and here I had another surge of emotion. It did the robot! Yes, robotic surgeon named Da Vinci! Of course, it's the doctor, but by a robot to remove the tumor very precisely and avoid many complications. In General, I returned from the medical centre Ichilov already healthy, I still do not care, and I understand very well how at the time I made the decision to seem Israeli doctors. I was recommended to undergo an annual examination to control the disease, and passing it, I also plan in tel Aviv, in the same clinic. President of the Oncology Service Shiba Hospital. Professor of the Department of Clinical Medicine at Tel Aviv University. A leading specialist in oncology gastroenterology .